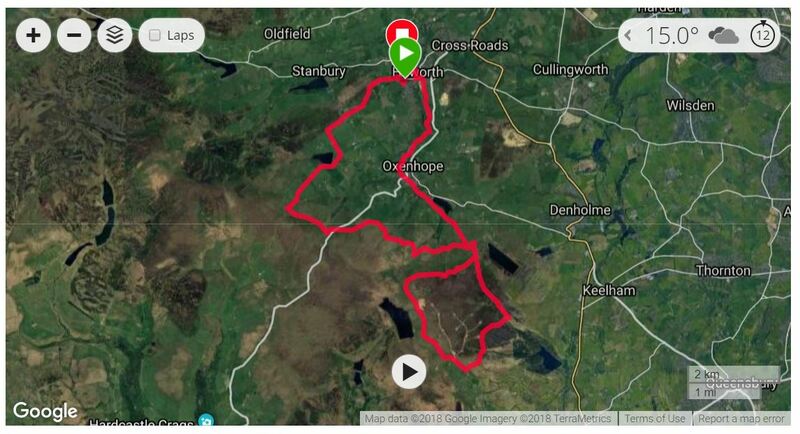 Richard Hamer reports from Bronte Country: Four OAC people turned out for the Yorkshireman Half Marathon held on a very wobbly figure of eight course starting from Haworth and circulating Oxenhope and Ovenden moors; and one of us was a winner! With a road half marathon coming up in about a month in Palma I was going to do the Vale of York but Phil Robinson fancied this so the 14.8 miles Yorkshireman it was. Organised by Keighley & Craven it’s recommended to do a recce beforehand but I didn’t have enough time, although Phil had walked it a couple of weeks previously in three and a half hours. My only benchmark was the Wharfedale Half which I did this year in 2:20 so taking into account the extra distance and general lack of running (and having had summer man flu) I thought maybe I could get around in 2:30, but I amended that on the start line to 2:40. The Yorkshireman has 494m of ascent and the Wharfedale 523, a lot of which is the uber steep Mastiles Lane. Thankfully the heavy drizzle that had started on the way over stopped just before the off, leaving periods of sun and a slight but very welcoming breeze. From the start the race was uphill and apart from a couple of very minor descents it continued upwards for around 3.75 miles before levelling out; although some of the up bits were long and steep; so I reckon it’s a tougher course than Wharfedale. From mile 10 the route was mostly downhill although by then I was starting to suffer. From Oxenhope, and with just under two miles to go, no amount of fluid or gel could help me and it was obviously that I was going to be nudging 3 hours. Finally I arrived at the train station in Haworth but then there was the sting in the tail – an uphill section to the finish of about a third of a mile. Despite my finishing time and exhaustion it was an enjoyable day out, and it was really nice to run somewhere that was totally unknown to me; every corner was a new adventure. For Otley AC, Victoria Stainburn was 62nd in 2:08:35, Louise Williams 86nd in 2:14:58, Philip Robinson 157th (and first MV70) in 2:41:40 and I wobbled home 192nd in 2:56:16. Total 252 finishers with the winner being Robin Howie (Wharfedale) in 1:40:08 and the first lady in 12th place was Annie Roberts in 1:51:59. The last person came home in 3:57:25. Once again another great performance from Phil. cracking running from vicky and louise! I agree with Richard about the awesome performance of Phil R. the time of 2.41 is just powerful . I liked as well the report from Bronte Country and also the 2.56 of Richard H. is not bad at all considering as well the poor fitness . Louise W. had a great running , she finished in 2.14 , Louise was fast indeed . Also Victoria S. had a good Half marathon .